This edition features tools to start your New Year off in alignment with all that you are and all that you are becoming! With the highest intention to a great start! Blessings! There is an angel inside all of us, one that knows our true value. The side dedicated to the perfection of that which you truly are. The source that connects us all. The love that is the fullness of you. It is time to step into your authentic self, the one who is a creator of your perception and your life! So when thinking of a new year, its often made easy by most this season, to connect to that self. So many people take this specific time to get wonderfully dedicated to themselves as best they feel they can. They decide that if they simply give more attention to a desire they would like to fix, this new year will be much better than last. But those who are actively seeking enlightenment know a bit different. They know that much of a world asleep at the wheel, well they spend a great deal of time focused upon holidays as their unique time of celebration and or improvement. But this is really an everyday occurrence for those brave enough to embark upon a truly awake existence. So as we turn the clock one more glorious day upon this beautifully balanced earth, it's the continued awareness that we celebrate. Not really new goals and aspirations. We already know within, every desire is held closely by our source energy. There is so much goodness to be tapped into right where we stand without even adding anymore to it. Intending to be the marvelous ride we agreed to in this human state. We are fresh in 2013 and the awareness levels of those seeking is rapidly approaching the leading edge as is felt around us. Things are moving faster than ever before. T he light within brighter and more clear than history has ever seen. The energy pulsing at speeds of light. A body cleanse starts in the mind. The more mentally prepared you are for your detox, the greater your chance of success. Use your detox time to reflect, connect with your inner-self and appreciate the moment. With the new year comes new changes! Start it off right with an all natural body cleanse! A body cleanse is good for anyone healthy and especially great if you already have health aliments We want to share with you ways to maintain bowel, liver and kidney health the natural way! There are a number of detox programs out there, and not only are some of these ineffective, many are actually dangerous so always do your research! needed. If you need to cry do so. What you are feeling is the severing of these connections. To help this process along I recommend receiving some sort of energy healing session, treat yourself to a massage or begin a regimen of yoga or meditation to help release the cells from your being. State this affirmations three to ten times daily. Please note that all affirmations created should be positive and lifting.. As to promote optimal wellness. These shifts and changes should always be in accordance with your higher self, I AM Presence or Divine Will. Never should this approach be used to go against someone's process or Free Will. We always have a choice. To complete this process, it’s important to then begin to lay down your new foundation. This foundation is the best part. This is where you can start implementing all that you desire to come your way. You can create positive affirmations to say daily, ushering in prosperity and abundance or you can create a list or Vision Board filled will all of your goals and wishes on it, that you desire. Filled with positive thoughts and ideas. Where is your journey going to take you? Will you go back to college or finally look for a new job? Try to keep your goals centered around love and promoting positive feelings about yourself and your life. The possibilities are endless. Take time and meditate on all that you wish to have and see it fulfilled. See yourself already achieving all your amazing goals. See you life. Filled with Love of Family, Love of Friendship, Love of Neighbor. See it amazing and prosperous. Have faith in your New Beginning. Know in your heart and mind that you are deserving of all this wonder and more. See yourself you are there, you achieve this all. You are amazing and loved. have to work things out with. Listen to your heart. If you’ve been waiting for “the right time” with something because some things may not seem stable enough for you….now is the time to stop dragging your heels. Do it! Take the leap, and you will be rewarded. Live the life you dream of. There are no exceptions, you can live however you want to, and pursue your dreams. There’s no time like today! Start now, and you could be living your dream tomorrow. Put all those beautiful, creative ideas into action! You’ll never succeed if you don’t try. So go for it! Tammy Murray-Cousins $20 off a one hour Human Design Reading or 20% off any other offered service or product. Harmony Network Chiropractic & Yoga Dr. Debra Babcock offering a Complimentary Wellness Consultation, Exam and Follow-up Visit. The Celestine Prophecy By James Redfield In the rain forests of Peru, an ancient manuscript has been discovered. Within its pages are 9 key insights into life itself, insights each human being is predicted to grasp sequentially; one insight, then another, as we move toward a completely spiritual culture on Earth. Drawing on ancient wisdom, it tells you how to make connections among the events happening in your life right now and lets you see what is going to happen to you in the years to come. The story it tells is a gripping one of adventure and discovery, but it is also a guidebook that has the power to crystallize your perceptions of why you are where you are in life and to direct your steps with a new energy and optimism as you head into tomorrow. The Indigo Children By Lee Carroll and Jan Tober This book is a must for the parents of unusually bright and active children. Indigo children are those who display a new and unusual set of psychological attributes and show a pattern of behavior generally undocumented before. In this groundbreaking book on the Indigo Child, international authors Lee Carroll and Jan Tober report the information of this increasingly documented and world-wide phenomenon and tell you how to identify this behavioral pattern and guide you on how you, as a parent or teacher of these children, can help them realize their amazing potential not forgetting their spiritual needs or specific health issues. Hosted at: Transform Holistic We will be giving you ideas that you can use right away! Grow your audience and potential client list in one week! 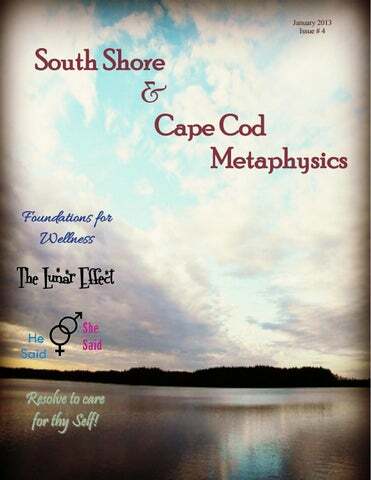 We will brief discuss South Shore and Cape Cod Metaphysics and how we can help with Facebook! Donations to Transform Holistic are appreciated, for their use of space, but are not required. Resolve to care for thy Self! As the New Year is upon us and we are resolving to do things and not to do things, establishing strict rules to adhere to. Consider your SELF and work to keep ego in its place. It is perfectly okay to resolve to be healthier as you ring in the New Year; how about releasing ego and allowing Self to just be? Glide into the new year with the intent to simply nourish and love Self; this might be taking a yoga class, bundling up for a nice walk in the woods (which will help keep you grounded), get plenty of restorative sleep, grab a nap, and focus on the Abundance in your Life! You might consider doing a bit of a cleanse or a detox, knowing you’ve perhaps indulged in heavier, more rich, dense foods that you normally don't consume. Focus on detoxifying that beautiful liver of yours! There are many ways to support your liver and kidneys as they work to flush out those toxins; consider milk thistle or a simple greens smoothie with cucumber, parsley, kale, lemon & chia seeds! And my personal favorite, an Epsom salt bath with a bit of lavender oil! The Epsom salts provide the healing benefits of magnesium as your Body works gently absorbing this miracle mineral! You’ve got to soak for at least twelve minutes with two cups Epsom Salts in your tub in order for your skin to absorb this mineral. This is an excellent way for you to detoxify! The lovely scent of lavender will help soothe and relax you. I'll also be leading a group cleanse in January, let me know if you’re interested in joining. You can simply dial in from the comfort of your home, gain knowledge & support via our call and be on your merry way with your cleansing & detoxification info, right at your finger tips! Another really nice and easy, free thing to practice. The recommendation is to actually keep a journal. A journal that you can write, say, three happy things that happened for you that day. Or perhaps writing five things you are grateful for, that occurred that day. I find that I don't have time to write another thing down, come restoration time. What I do, and I sincerely believe that it works, because on the mornings that I know I set this into practice the evening prior, I seem to awake with such a spring and liveliness, such a truly happy feeling, right in my solar plexus! I believe ALL of us have the capacity of experiencing this, we just need to train our subconscious thoughts with the Power of Positivity! And a simple way to achieve this is the following. Before meditation, simply focus your thoughts on what the positive things were that happened for you on that day and think of each and every thing that occurred for which you are grateful Then move into your meditation, which can be as simple as deep inhales in through your nose and gentle exhalations through your mouth. A simple way for you to balance your system and manage stress (without really having to even do much!) is to take your right hand up to your nose and with your right thumb, gently press shut your right nostril, inhaling in through the left nostril, hold breath for a few seconds and then release fingers away from nostril and take right middle & ring fingers to left nostril, gently press closed and exhale through right nostril. Continue alternating for 5 - 10 minutes. This will help you manage stress and balance your sympathetic and parasympathetic nervous system. It is when these two are out of balance that your body releases stress hormones, which wreak havoc on our systems when this occurs. So, this is a simple way to help you stay balanced. Remember as you navigate into the New Year, to be gentle and loving with yourself, do take care of yourself. Practice self care when you can. Even the smallest of things really do help! And Eat Healthy. Even if you find yourself indulging at Holiday parties, try to add in some green veggies into every meal. This will make an enormous difference for you as well! And lastly, remember to LOVE. Love yourself, love everyone around you and get lots of HUGS!! They really are SO important! One hour Free Seminar Grow your audience and potential client list in one week! Aries: This month you are back in action with perhaps a more creative or inventive approach to career or ambitions. The 4th should bring you greater opportunities so make the most of the energy at your disposal. Frustration comes in the form of roadblocks on the 7th and 31st. Try to do things on your own and away from the boss or other authorities during those times. This is the month where you let go of what is no longer secure or reliable so you can make room for new things coming into your life in April. Taurus: This month brings new goals and possibilities in your life. It’s a great time to travel, study, or otherwise expand your outlook. Perhaps now is the time to find love in a foreign world. Enjoy what you can but don’t over indulge in the reverie. Sometimes things are just not so great and that is ok too. The dark, dirty, and mysterious are part of life too. The 10th can bring a “holy love” into your life. The 12th changes your values and sense of worth. On the 14th, watch your spending patterns. The 16th brings a deeper sense of purpose and fulfillment and the next day a commitment to a relationship. The month ends with a question around where to take things next. Gemini: There is lots of anxiety this month as you are confronted with long term possibilities and the deeper significance. You need to dig deeper and see what it all means. To be understood you must first attempt to understand your own motivations and obsessions. Can you finally confront you as the paradox? If you can’t let go of what you think then you can’t become what is beyond your present mindset. It’s time to relinquish the white lies and see the reality in your deepest experiences. Key dates are 1/1, 3, 5, 6, 114, for tension and mental processing. Positive experiences or conclusions maybe drawn around 1/18, 22 just before Jupiter turns direct on the 30th. You are about to approach life from a different perspective based on the “healing” forces of January. The final challenge to this energy now is experienced on the 25th with a reality test. Your thoughts have long term affects and you need to treat them seriously as you are the breath of life. Cancer: This is the time of year where relationships are your prime focus. Who needs to be nurtured and who needs to grow up? The New Moon on the 11th has you focusing on responsibilities and karmic connections. Your sensitivity to the others in your life has you looking for that safe place that protects you from the emotional waves. Your adaptive nature may have you bending over backwards without giving you the support you seek. Allow others to have their moments without taking on their stuff, you need to be reflective not receptive. Most challenging days are 4, 5, 6 and 16, 17, 18 for this month. Leo: Health, work, habits and duty are the focus this month. Love is an act of service and you may be more generous with your time or energy now. The thing is no one can continue at that pace for long so it might be hard for you to sustain your efforts long term. This month may feel like hard work with little appreciation or reward. If a dramatic outburst pops up in the workplace pay attention to what is setting you off. It is time to integrate or adapt your energies and get things in good working energy. Now is a good time to get a checkup and begin healthy new patterns in your life. Best days the 24th and 25th. Most challenging days are the 6th, 21st, and 30th. Virgo: Now is the time to do the things that make you feel important and help you to find recognition for your efforts. Do you start selling those wonderful handmade items or start a part-time business as the efficiency expert? This is when others could take work seriously and see you as the expert or authority. Time to try something new on the 3rd. You might find it is life changing and profoundly important on the 6th. On the 18th put your heart into and find happiness in serving yourself and others with your handiwork. You could receive opportunities or greater interest in what you are doing around the 22nd. The 25th will be the test on your level of commitment and personal investment, in the things you love to do. Libra: This is when home looks the best. You are either entertaining at home or spending time with your family now. You are happiest when everyone is getting along and sharing the love. You might be redecorating or getting your nest ready for a new arrival, this month home is where your heart is. Just don’t expect everyone to feel the same. If someone feels like an outsider they may do their best to break away or make others feel alienated at this time. There is a lone wolf in every pack. Expect the 4th, 12th and 14th to be a little difficult. The 10th brings lots of beauty while the 16th and 17th bring certainty and greater fulfillment. This is the time of year where you relinquish old commitments or social contracts. 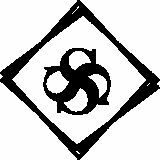 Scorpio: A very social time with lots of communications and people in your life. You may feel a bit overwhelmed with all of these people in your energy field so make sure to get away from it all or suffer the consequences. You do your best processing when you are alone with your thoughts and we all know what a deep thinker you can be. You may have a hard time dealing with the social chit chat so expect to feel a bit out of your comfort zone for some of this month. Some who need your good advice or insights may be seeking you out for a counseling session. Best days 1/6, 16, 29. Difficult days this month are the 2nd, 21st, 24th and 26th. Sagittarius: This is the month you have been waiting for as your planetary ruler goes direct on the January 30. Jupiter has been retrograde since October 3, 2012. During that time we have all been reconsidering our approach to communication. For you, this approach ties to your assets, self- worth and values. You are a natural optimist and gambler by heart but with Pluto moving out of your sign in 2008 things have been a little less possible and way more serious than you like. Now is the time for you to look at how you distribute and share your wealth. With limited resources you may now need to be a bit more cautious or serious in your approach to finances. You can no longer rest on your laurels it’s time to get back out there and prove yourself once again. Look to your relationships for some helpful advice or guidance, just this once let someone else’s good idea be heard! Best day are the 4th, 22, 25th. Difficult dates are the 5th,11th,14th and 16. Capricorn: This is your time of the year! You are born to be the ruler, authority, and set the rules. You see the seriousness of the situation, no matter how hard things become you succeed at the task. Of course it might be nice if you could trust others and allow them to play their part but that is what Aquarius will show you next month. So for right now write the contracts, establish order, and get the job done. Just remember rules are meant to be broken…only just not now. You are going to act on your authority. Best days 1/6, 1/17, 1/31. Difficult days are the 4th, 7th, 25th, and 30th. Aquarius: It’s time to wait in the wings as Capricorn takes charge. Perhaps it’s a good thing that you are in a place of retreat as the electrical currents are on high velocity. So many images and thoughts flood your mind with what is pending in the months ahead. Brilliant ideas come from the spirit world and provide insight to be used at a later date. You are anxious to be free of the old, to purge the outworn and will probably do so by month’s end. You can be your own worst enemy in your pursuit of freedom at any price. Watch that you don’t discard anything in haste or in a burst of rebellion; there are necessary steps that you must complete. You need to keep things secret for just a bit longer until others are ready to hear what you have to say regarding you struggle with self-sacrifice or self- defeat. Best days 1/22, 24. Difficult days are 1/3, 12, 20, 31. Pisces: Focus on group support and dreams of the future. Those who feel distant may be drawn together through your compassionate outreach. You are the one who can adapt to all the individuals and bring connection on a spiritual level. Though you make act as an angelic presence to others make sure you are allowing your more human side to appear. Don’t fall victim to other’s illusions placed upon you, speak up for yourself. You may bring subtle energy into the world that provides unity and salvation yet you may also be the one who ends up being the sacrificial lamb. Stand in your own reality don’t be a stand in for someone else’s dream. Good energy days 1/1, 10, 20, 21. Difficult days are 1/6, 10, 22. Winter Clarity Overhead, across the sky, lies the Winter, clear and silent. Ever brighter shine the stars, shimmering in stark darkness. Baring witness is the Moon, to the Sun that shines its starlight ever farther from the Earth. May we embrace this Winter's birth. Let it remind us once again that we are not constant and indeed need changes. New ways to see the world give us that chance. As the cold lets the air feel thinner, and the lights seem clearer, we can feel ourselves become ready for a change. One that brings us closer to a new beginning. So as this Winter will end, so begins the Spring. Blessed is this Winter's beginning. To Enlighten your Journey, South Shore and Cape Cod Metaphysics offers you a green avenue of connecting with new experiences.